The beginnings of a page taking life. A bit of a misnomer, because a comic page's life starts in the script, and goes through various stages of layouts (storyboards) until the script writer and artist are both satisfied with the page. Pencils, though, are the first step in the artistic production of a finalized page. 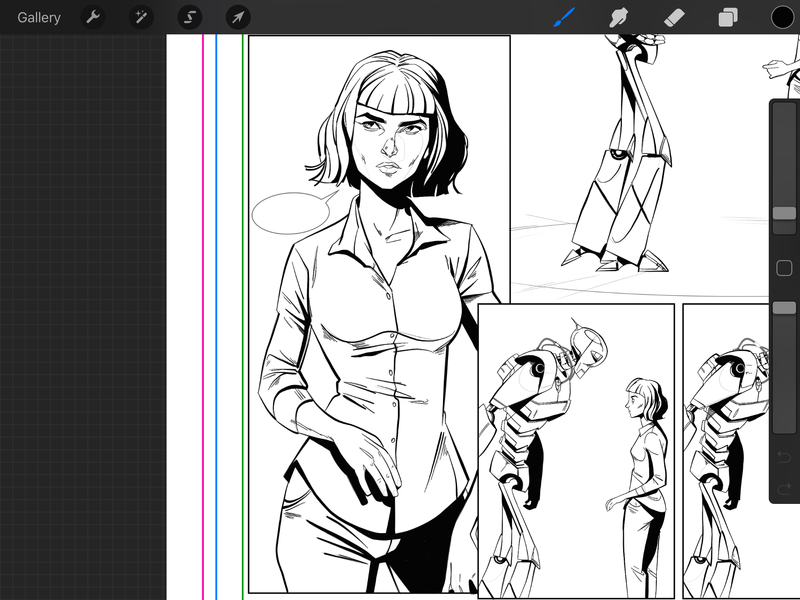 The pencils are the base on which all of the other layers of talent are based on, and although each inker, colourist, letterer, etc. is different, I prefer a clean pencil base to work on. For this project, the panel art is penciled by Christopher Ables. His lines are clean, tight and direct in their intention. It's been a real pleasure to continue work on such a talented illustrators pencils. Until much more recently, comics would be inked exclusively by hand. Whether it was inkwell style, pen or marker, hence the name. 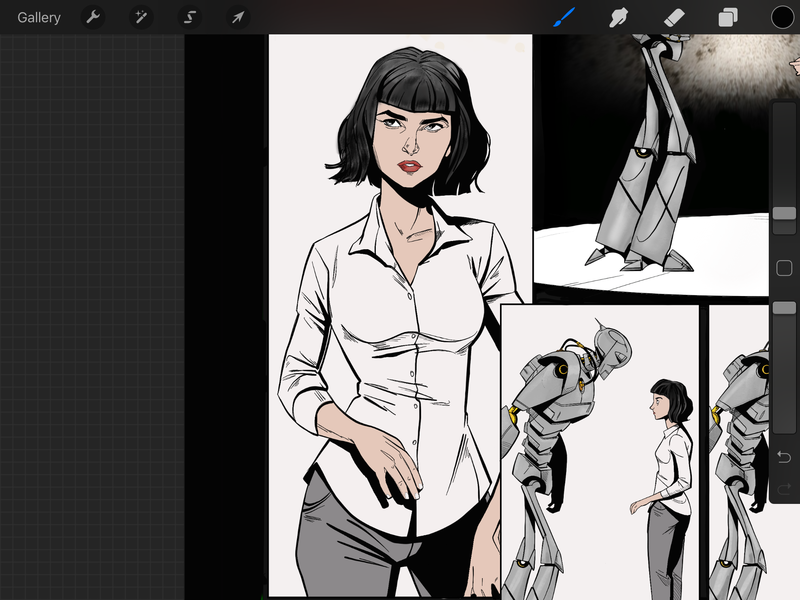 With the advent of digital art tools being financially accessible to the average user, many artists have turned to "inking" digitally. The portability alone of having a tablet based system has been worth its weight in gold as a time saver. I started with a paint brush and inkwell to begin my skills, and have since managed to get more and more skilled with the digital counterpart. Lots of artists love Wacom, but I found my digital inking skills on an iPad with the Apple Pencil. Line weight and texture in the inking help the images to start to come alive, and prep the art for the colouring process. Laying in base colours can be amazingly fun, but amazingly daunting. Choosing the right blend of colours in a panel and for a page, that will likely resonate throughout the book, is key to keeping things jointed. Also, the next step of laying in highlights and shadows means choosing a colour with the ability to be changed in hue, saturation and brightness to illicit complimentary highlights and shadows that aren't going to interfere with other parts or panels of the page. The next post will focus on highlights, shadows, lettering, and getting pages ready for print. Blood and Motor Oil – W.I.P.